Multiplayer battles are split between Wireless and Wi-Fi battles, although they both function the same. Only two players can do battle at the same time, and both players must own a copy of the game. For Wi-Fi battles, you can choose to either battle your friends (using friend codes) or random opponents. For those interested, Voice Chat is enabled for friend-code battles. To begin with, players form teams consisting of 5 characters from the main campaign. Map – Choose battle map (choice of 6 maps, or select map at random). Turn Limit – Set maximum number of turns from 5-10 Turns. Card – Toggle use of Cards (see later) on/off. Autohandicap – Choose whether to adjust character Levels according to your opponent’s skill level. Once the rules are set, the battle begins. Players take turns moving their units on the multiplayer-exclusive battle maps. On each battle map, there is a castle situated towards the centre. 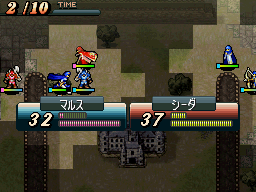 If an unit waits on the castle gate, the castle flag changes colour to their team’s colour. You win the match by either having the castle flag be your team’s colour once all the Turns are over, or by annihilating the opposing team. Upon winning a multiplayer battle (practice battles against the computer don’t count), you will be awarded a Card. These Cards have various effects attached to them, and one Card can be attached to a multiplayer party before battling. Just some notes that players may find useful. You can use any character in your team, including the Manaketes and the faceless replacements. The Aum staff, Master Seal, Elysian Whip, Maturity Drop, Bond Drop and Rainbow Potion cannot be used. If Fog of War is enabled, you can only teleport allies (using the Warp staff) to visible squares. Unlike in other games, Thieves do not have extended sight in Fog of War; all characters have a sight of 2 squares by default. When a character finishes moving in Fog of War, they will also reveal all the squares within 2 squares along their moved path.